History: The Supremacists' origins are unrevealed. (Black Panther II#2 (fb)- BTS) - The Supremacists trained at a top-secret weapons research facility in Azania for "endless months," honing their powers to the razor's edge. (Black Panther II#1 - BTS) - As the Panther (Sekhem Naville, an Azanian black empowered by Bast to oppose apartheid) inspired the black citizenry of Azania to revolt, Azanian officials mistakenly assumed him to be the Black Panther (T'Challa), the ruler of neighboring Wakanda. (Black Panther II#2) - While the Supremacists trained, General Moorbecx interrupted them, telling them that he knew they were getting stir-crazy and that he had a way to alleviate their tension. Moorbecx explained to them that they were to travel to Wakanda and take the fight to the Black Panther since conventional forces seemed unable to contain him. (Black Panther II#1) - General Moorbecx ensured the Supremacists that the Black Panther had slaughtered his last Azanian, and that he must be destroyed and his homeland punished...and that the Supremacists were just the ones to do it. (Black Panther II#2) - The Supremacists crashed through the roof of the ruling Wakandan tribal council, wherein T'Challa (who had been abandoned by the Panther God) was undergoing a test to prove his worthiness. Harrier blasted T'Challa's challenger, T'Swana, with a taser when he threatened them, but the Supremacists were displeased to see that the Black Panther had taken advantage of the distraction to escape. 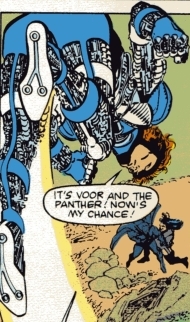 Voortrekker tracked the Black Panther to the ceiling, and he leapt down on Voortrekker's back, but Captain Blaze then called for "Maneuver 15" and fired a plasma blast, which Voortrekker backed T'Challa into. Manipulating Barricade into trying to catch him in his shields, T'Challa used the shields to propel himself back out through the hole the Supremacists had come through, perhaps hoping to lead them away; instead, the Supremacists began using their powers to level the capital city. T'Challa left an easy trail for Voortrekker to follow and ambushed him; when Harrier tried to blast T'Challa, he -- following Voortrekker's example -- swung Voortrekker into the attack, knocking him out, and then dropped Harrier with a thrown rock. Captain Blaze arrived on the scene next and set a hut on fire after a projectile from it missed him, but he was disgusted to find it had been a Wakandan youth wearing Harrier's glove who had fired the weapon. The Black Panther surprised Blaze, dropping him with a single punch. T'Challa then captured Hungyr and rushed into the Techno-Jungle. When the White Avenger flew in and began tearing the jungle apart, T'Challa goaded him into flying towards him, and then swung Hungyr into him, draining the White Avenger's powers and rendering him unconscious. Barricade was the last to arrive in the Techno-Jungle, and T'Challa hurled the bound Hungyr into him--Barricade's powers and consciousness were drained into Hungyr as well. 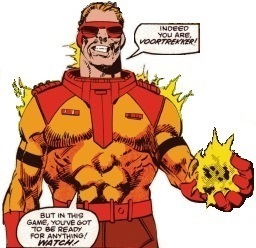 With the Supremacists defeated, Moorbecx prepared to launch a thermonuclear device at Wakanda. (Black Panther II#3 - BTS) - T'Challa disabled the detonator and navigation system of Moorbecx's weapon, rendering it harmless. (Black Panther II#4 - BTS) - Following proof of T'Challa's innocence, the Azanian government called an immediate cease-fire, declared amnesty for those who had rebelled, and began the process of reforms by initiating a bi-racial commission to consider the grievances of all its citizens. (Night Thrasher II#18 (fb) - BTS) - Hungyr permanently retained the White Avenger and Barricade's powers, which he spent months painfully struggling to control. A new female Harrier was chosen to replace the original. (Night Thrasher II#18 (fb) - BTS) - General Oostkamp and his bi-racial military junta rose to power to fill the vacuum, applying tyranny equally to all citizens. The racist faction, the Purity Front, sought to regain control, and when Oostkamp died, the country became volatile. Night Thrasher (Dwayne Taylor) was sent in to get the American ambassador to Azania (and his family) out safely. (Night Thrasher II#18 (fb) - BTS) - The Supremacists assaulted the Wakandan embassy, seeking to execute ambassador Ndede. (Night Thrasher II#18) - Night Thrasher joined with the anti-government, anti-Purity Front resistance, after which he entered the Wakandan embassy and found Captain Blaze just as he was preparing to kill Ndede. Blaze exhausted Thrasher's insulating foam and incinerated his truncheon; but the Black Panther arrived and tackled Blaze, holding him in a "Full-Nelson" while Thrasher punched him out. After Wakandan soldiers arrived to take Blaze into custody and secure the embassy, they recovered US ambassador Cromwell and sent him and his family to Wakanda. Night Thrasher and Black Panther (and Ndede) took a separate transport to Wakanda... but Hungyr and Harrier were secretly stowed aboard. Hungyr was unable to contain his power--he bulked up to full Barricade-size and destroyed the ship. T'Challa and Ndede escaped with ejector seats, and T'Challa used a rocket on his seat to catch Thrasher, while Hungyr used Barricade's protective aura to save himself and Harrier. As T'Challa flew his chair towards them, Harrier blew up the chair while Hungyr brought up the White Avenger's powers. Thrasher kicked Hungyr, who easily withstood it and flattened Thrasher with a punch. 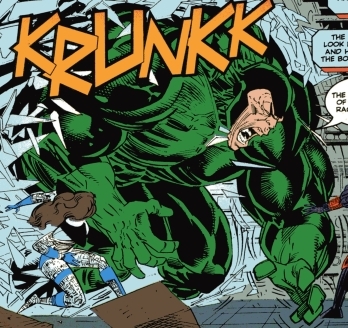 Hungyr then relinquished his White Avenger powers to bring up his power-siphoning ability, but when he tried to steal Thrasher's powers, he found there were none to take (since Thrasher wasn't super-powered), and Thrasher punched him out. Harrier somehow got the drop on the Panther and threatened to kill him if Thrasher didn't give up, but Ndede flew between them with her rocket chair, and the Panther used the distraction to tear out Harrier's power input cables. The Azanian refugees asked the Black Panther to lead and protect them from the chaos their country had been undergoing, and he agreed to assemble an international peacekeeping force to provide support until elections could be held. Comments: Created by Peter B. Gillis (writer), Denys Cowan (penciler) and Sam DeLaRosa (inker). The Supremacists motto: "For Duty...For Honor...For Country!" Barricade, Voortrekker, and the White Avenger are seen on the cover of Night Thrasher II#18, but not in the story itself. 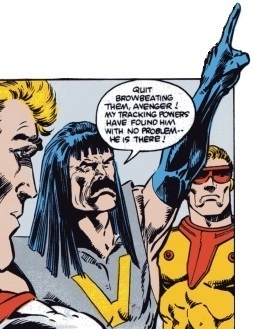 The real names for all Supremacist members and General Moorbecx name were revealed in Marvel Atlas#2. He accompanied the group to Wakanda, where his powers were apparently permanently drained by Hungyr. Barricade could form force-fields--typically, the shields formed over his hands, with which he could stop, deflect, or catch others; his fields could halt even the White Avenger flying at full speed. He apparently had superhuman strength, and could also use the shields to scoop up rocks, earth, etc. Perhaps the leader of the group, he accompanied them to Wakanda; he seemed disturbed when he accidentally almost killed a young boy, wishing instead to confront a warrior. Later, when assaulting the Wakandan embassy, he seemed extremely bloodthirsty and more than willing to execute the helpless ambassador. He overwhelmed Night Thrasher's insulation foam and destroyed his throwing truncheon, but the Black Panther was able to hold Blaze while Thrasher punched him out; Blaze was taken into custody by Wakandan soldiers. Captain Blaze was able to project fiery blasts that could incinerate a solid iron-wood truncheon traveling at 800 feet per second. He had some combat abilities, as when he turned the White Avenger's momentum against him and sent him flying into Barricade. Considered the "baby" of the Supremacists, Harrier accompanied them to Wakanda, where he readily turned his taser on T'Swana. T'Challa maneuvered Voortrekker's body to take Harrier's next attack and then knocked Harrier out with a small thrown rock, which caused him to crash to the ground unconscious--he was either injured or killed in the fall, or just retired, because he was succeeded by a female operative. Harrier wore an armored suit that could fly and project a number of electrical or projectile weapons, but he had no protection on his head. 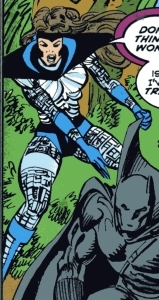 Successor to the male Harrier, she participated in the assault on the Wakandan Embassy, then accompanied Hungyr in an ambush on Night Thrasher and the Black Panther. She blew up the Panther's rocket chair and managed to get the drop on him, but she was distracted by Ambassador Ndede, and the Panther tore out the power inputs on her armor, after which she was apparently taken into custody. She wore armor that allowed her to fly and project energy blasts. 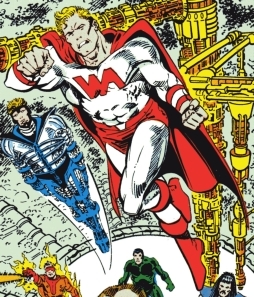 He sought to steal the White Avenger's powers during a training session, but was interrupted by Moorbecx. He accompanied the group to Wakanda, where the Black Panther manipulated him to steal the White Avenger's and then Barricade's powers, which ended up being permanent. He spent months painfully struggling to control these energies, and he later participated in the assault on the Wakandan Embassy and accompanied the female Harrier in stowing away on a ship to ambush Night Thrasher and the Black Panther. However, he found it too painful to contain his energies, so he used Barricade's size and power to burst forth, and destroyed the ship. He protected Harrier when they landed, and he then accessed the White Avenger's powers instead and flattened Night Thrasher with a punch. 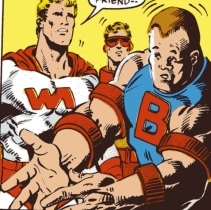 When he returned to his own powers to try to steal Thrasher's , he was surprised to learn Thrasher didn't have any powers--Thrasher took advantage of his surprise and punched him out. He was apparently taken into custody. He could drain superhuman powers on contact, apparently retaining them permanently under some circumstances. He didn't always siphon powers, as he was seen holding onto Barricade when they smashed into the Wakanda council meeting without absorbing Barricade's powers then. A hunter and warrior from Zimbabwe of some renown, his reputation was known by the Black Panther, who wondered why Voortrekker had teamed up with "these racist thugs" (The Supremacists). He was serious, generally all-business, and discouraged the others from harassing innocents when they went to Wakanda to get the Black Panther. He twice tracked the Black Panther--on the first occasion, the Panther grabbed him, but Voortrekker employed "Maneuver 15" and backed up to push the Panther into Captain Blaze's fiery blast; the second time, he was ambushed by the Panther, and as he struggled, the male Harrier attempted to blast the Panther with certain weapons (tranquilizer darts? ), but the Panther flipped Voortrekker into the way of the projectiles, and Voortrekker was rendered unconscious. He was later identified as an opponent of Impala, an apparent criminal from Zambia, West Africa. After initially entering Azania pursuing the Zambian criminal Impala, the hero Voortrekker was enticed to join the Supremacists for a time. Voortrekker was a master tracker (either from experience or superhuman ability) and an experienced, swift, and agile combatant. Courtesy of Encarta Encyclopedia: Voortrekker is a name given to Afrikaners (or Boers) who migrated north from the British Cape Colony (modern southwestern South Africa) during what became known as the Great Trek (1835-1843). The word Voortrekker means "pioneer" in the Afrikaans language. The migration of the Voortrekkers marked the birth of Afrikaner nationalism and the determination of Afrikaner, settlers of Dutch and French Huguenot descent, to shake off British control. In the course of the Great Trek, the Voortrekkers fought the Zulu and other Bantu-speaking peoples for their land. The Voortrekkers then established the Afrikaner republics of the Orange Free State and the South African Republic (in the Transvaal region). Leaders of the Voortrekkers, such as Hendrik Potgieter, Andries Pretorius, Pieter Retief, and Dirk Uys, are among the most revered names in Afrikaner history. The Voortrekker Monument in Pretoria, inaugurated in 1949, was built as a symbol of Afrikaner nationalism, and as a celebration of the Great Trek. Powerful but headstrong, he sometimes flew into a situation, heedless of any potential threat. He accompanied the group to Wakanda, where the Black Panther goaded him into flying after him, then the Black Panther swung Hungyr into him, and Hungyr apparently permanently siphoned the White Avenger's powers from him. 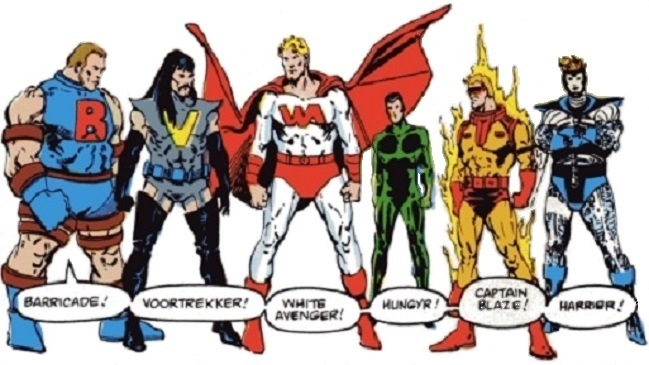 White Avenger had superhuman strength and durability, and he could fly; he apparently also had hyper-senses, or at least hyper-vision.